Chihiro & Yubaba. Chihiro piss Yubaba off .. wow .. scary big face!. HD Wallpaper and background images in the Spirited Away club tagged: chihiro yubaba. Chihiro piss Yubaba off .. wow .. scary big face! 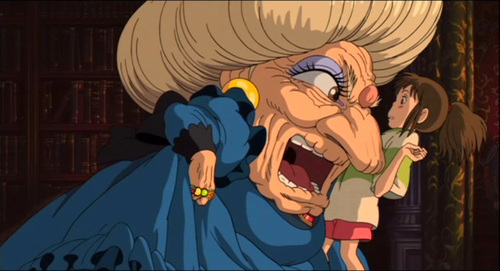 never knew yubaba was that ugly till I got a good look at her. Judging by the way Yubaba holds her skirt, I would have thought she would pull a can-can.